We have a great choice of farmers markets in the Brecon Beacons, bringing together some of the best local produce. So here’s our choice of a few of the best loved, so you know exactly where to get those local spuds, leeks, cheeses and Welsh gifts. Stockpile your kitchen and freezer with some of the finest quality foods in Britain. The market offers great value and an excellent selection of locally produced meats, vegetables and other foods. There are also plenty of local craft makers to discover that offer finely crafted products as outstanding prices. Held on the second Saturday of every month. For information on stalls email info@breconfarmersmarket.co.uk. The next market is on the 14th July. More here. Local producers selling their own produce that has been grown, reared or made by them. You’ll see seasonal vegetables and fruit adorning the stalls along with every other produce that customers need for their weekly shopping list! Last Saturday of each month. For information on stalls call 01550 720233. The next market is on the 28th July. Located in Llangynidr Village Hall, the monthly Farmers’ Market offers a great range of local produce. Stalls include locally produced meats, butter, eggs and cheeses; cards; knitted and other craft items; cakes and Fairtrade products. Free Parking in the Village Car Park directly opposite the Village Hall. No Entry Charge. Why not combine your visit with a walk along the Brecon and Monmouthshire Canal, lunch at one of the village’s two pubs or a Sunday service at one of the chapels or church. The next market is on the 29th July. Carmarthenshire – SA19 6HW. Open Fridays from 8.30 am – 12.30 pm. Closed: Two Fridays after Christmas Day. Also open: Carmarthen Market, SA31 1QY on a Saturday from 9.00 am to 4.00 pm. Market contact: 01558 668744 or lynnedavis512@gmail.com. The next market is on the 13th of July. 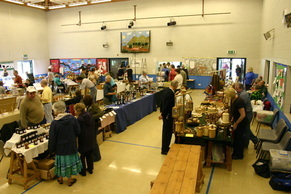 Located at Usk Memorial Hall held on the First and Third Saturday every month, from 10am-1pm. Since it’s creation in late 1998 the market has become a popular feature of a region famous for its fine produce, food festivals and much-acclaimed restaurants. The next market is on the 23rd of July. To pick up produce throughout the year why not pop into The Welsh Venison Centre and Beacons Farm Shop, offering stunning views of the Brecon Beacons from the farm which specialises in producing venison and also its own lamb, beef and locally-produced meat as well as deli items, bread and gifts from its Beacons Farm Shop. The Beacons Farm Shop is open six days a week – it’s a handy place to can pop in to pick up venison for a casserole or quality pork, beef and lamb. The team of butchers on site are always on hand to prepare meat to suit your recipe requirements and the friendly shop staff are happy to advise you on how to cook your meat to perfection. The farm shop also stocks a wide range of gift items and beautiful homewares. They even sell their very own deer skin rugs and also sheep skins which come in an amazing variety of colours and patterns. This entry was posted in Brecon Beacons, Brecon Farmers Market, farmers market, Uncategorized and tagged Brecon Beacons National Park, farmers market. Bookmark the permalink.